Shopping can be overwhelming, even for the most savvy shoppers. At some point, everyone does something or doesn't do something, that ends up costing them more money. There are so many stores, all with different pricing policies and ways for shoppers to save money, that sometimes when we are in stores, our brains seem to spin out of control and we make mistakes. Sometimes we purposely make mistakes because doing the right thing makes us uncomfortable. Either way, mistakes can add up and put significant dents in our wallets. Here are four common mistakes that you should avoid the next time that you shop. With the growth of the internet and having price information at our fingertips, many retailers have felt the pressure of having to adjust prices to remain competitive. There has also been an increase of retailers that now match prices with competitive stores. It is a fairly cost-effective way for stores to advertise that they have the best prices, since there are a lot of shoppers who will never take advantage of this cost saver. 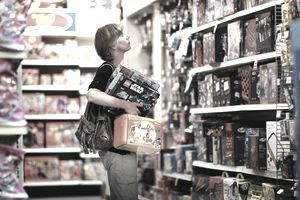 Grant it, a small percentage of shoppers ask for prices to be matched when buying higher-priced merchandise, but when it comes to lower-priced items, the interest in matching prices also drops. It seems many shoppers are reluctant to haggle over the price of their laundry detergent or the 12-pack of Cokes that they are buying and do not feel that going to the trouble to price match inexpensive grocery items warrants the hassle. However, it is just as easy to price match lower priced items as it is the higher-priced items. At Walmart, for example, shoppers are only required to bring in the competitors ad and Walmart will honor the advertised lower price. For shoppers who regularly buy groceries at Walmart, the money saved by price matching can really add up. It took me awhile before I price matched at Walmart and for all the wrong reasons. I felt embarrassed and concerned that I would irritate the cashiers or slow down the checkout line. But once I got into it and saw how easy it was to do, I watched the savings add up and enjoyed the convenience of not having to store hop to get the weekly deals. Price matching became as natural to do as pulling out my debit card. To this day my husband refuses to do it. He always says that he forgot, or that he left the ads at home by mistake, but I believe he thinks it makes him look like a cheapskate, which isn't the brightest reason to let money slip through your hands. It seems like every place that has products or services for sale, also has a loyalty program of some kind. The programs are generally designed to encourage customers to come back. But many of us are creatures of habit and go back to the same establishments, with or without a loyalty program, for various reasons. Maybe the business is close by, or we like their food the best, or we like the hours that they open, but for whatever reason, most of us have our favorite places. Being a regular often has its perks and many shoppers who return to the same stores or use the same services, never bother to take advantage of those perks. Week after week, month after month, the perks that go unrewarded to customers who never bother with loyalty programs is huge. Again, there was a time when I didn't bother with loyalty programs, unless it related to travel. I did not want to even bother trying to figure out how the different loyalty programs worked or see if it would be to my advantage to join. But not today and in return I pay next to nothing on items purchased at the drug store, get a free pizza every few weeks, get a free 12-pack of Coke Zeros every month, one free item dry cleaned, a free day at the water slide, a free pedicure about twice a year, free desserts, a dozen eggs for a quarter once a month, free plants at the nursery, and the list could go on and on. Shoppers who are regular customers should take advantage of the loyalty programs and get a little something back on the money that they spend. Another consideration is that the repairs made on refurbished products are often done with newer parts compared to what is inside the new, unopened products. Then there is the price difference between refurbished and new products, which can be significant, with savings of up to 50 percent off even more. And lastly, most refurbished products include a warranty, at least those that shoppers should buy. When you take all of this into consideration, why, as smart shoppers, do we ignore refurbished products when it looks like it could be one place to find a great deal? The answer is, we shouldn't. Here is one dumb shopping mistake that I have made more than a few times. When something is at a super-low price, it is easy to go a little crazy and buy too much of it, even to the point that if we lived 200 years it is possible we could still never finish using it all up. We all know that too much of anything can be a waste of money, and when you buy too much of the same food item, there is a big risk that it will go bad before it is consumed. Also, buying a lot of one item takes up valuable storage space. There is also the reality that we might just get bored using the same product over and over and just stop using it. Before buying an excess of any one product, it is always a good idea to stop and consider how often you will use it, where you will store it, and check when it expires. Stockpiling food and personal products can be a money-saving strategy, but not if it ends up getting thrown away.